A well-thought-out name for an architectural company can give it the confidence it needs to face the market and customers. Such names have the potential to draw the customers’ attention. With a perfect name, a business can think of building a solid customer base and brand identity as well. Most successful architecture companies have great business names. They can communicate well with their potential customers just by using a relevant name. This is especially important for a new company that has to compete hard to draw people’s attention. Architecture is a booming business. There are more than 300 top architecture companies in the U.S. Besides these established names, many new architecture ventures are running in your city to give your startup a fierce competition. You can pick your name itself for your architecture company. Or, pick a fictitious business name, which allows for the use of imagination, symbols, etc. Some firms have created names out of their initials of the firm’s principal players. So, there is a scope for exploring different name ideas. Many architecture companies have conventional names. Such names are the ones that were created by putting together the initials of the founders’ last names. Or, the first and last name of the firm’s owner made the name. For example, the architecture firm SOM name has the Initials of its founders Skidmore, Owings, and Merrill. Similarly, the firm HOK has the initials of its founders Hellmuth, Obata, and Kassabaum. An advantage of a personal name is that it conveys some ‘humanness’ that evokes trust. While using the initials looks good as it includes the founders name and there is a room for future growth, it becomes a problem if the firm has just one owner. If you use your name, the issue here is that nobody knows you. One person’s name makes an impressive firm name only when the architect is a celebrity like Frank Gehry and Richard Meier. Because these names are short, they look good on architectural firm logos, which are the trademarks of the companies. A disadvantage of using a founder’s name is that if the founder leaves the firm, it becomes difficult to remove the name. The customers may also not feel confident when they are dealing with someone else other than the firm’s owner. So, think twice before you want to name your architecture firm after your name. Looking For An Architectural Logo Design? If the traditional business names are not your cup of tea, think of a catchy name. Many architecture firm names sound formal. They may not be an inspiration for your firm. This is because most such names do not give a sense of what the firms specifically do. With a catchy name, you can easily convey your specific area of design such as Med-Design. If you do not want a fun-filled catchy name, just use your city’s name such as Springville Architects. Or, mix two words to make a different name. For example, Modative is the mix of two words mod and innovating, meaning an innovative way to do the things. The objective is to avoid being too serious. Such catchy names also make an architecture logo look great for making an impression on viewers. Architecture is a vast topic that covers a wide range of styles from different ages. Significant types of architectural styles include Victorian, Romanesque, Islamic, Baroque, Tudor, Bauhaus, Neo-Classical, Renaissance, Gothic, and Modernist. If you specialize in any of these or other styles, then you should think of giving a hint of it in the company name. That way, those interested in the architectural style will think of hiring your expertise. But if you deal in many architecture types, then it is better to avoid mentioning one particular type as you may lose the other clients. Your company logo design should also avoid having any specific word in its slogan or statement that indicates to the one type if you deal in so many. Brainstorming is an effective way to arrive at an idea that sounds good. All you need to do is to gather your firm’s core members and friends and ask them to shortlist some company name. But give them your guidelines that will keep them focused on what is allowed and what not. For example, you can tell that the name should look impressive on your business logo design as it is your identity of the company. It is very tempting to use words like architect or architecture as a business name of an architectural company. But there are some legal considerations in choosing these words in the firm name. The company that uses these words must have a registered, licensed or chartered architect who should be responsible for controlling the company’s architecture services. This means that the authorities will serve the responsible person the notice if something goes wrong. So, do not use these words if you do not want to appoint one such person in your company. If you still have these words in the name, you may be subjected to legal penalties. Also, note that when you hire a logo designer to create your company’s logo — a primary visual identity of your business — a simple name will encourage the designer to come out with unique ideas. Any name that people find difficult to pronounce should be avoided. Some names adopted from different cultures for the sake of novelty can prove to be hard to spell out for native speakers. If it is difficult to pronounce, it is likely to be spelled wrong when typed on a search box. Such confusion among the audience is not good for the growth of a startup especially. Instead, prefer a short and simple name that everyone can pronounce. Such words easily come in a discussion or casual talks about current architecture scenario. So, the name should have an easy recall value as well. With a simple name, you can hope of building an authentic brand identity of your architecture business. While you picked a name carefully after some brainstorming sessions, it is useless if someone already has registered it as a trademark. So, do not finalize the name until you have checked its availability for registration with the state or federal authority. In the U.S, check the availability of the name with the federal Trademark Electronic Search System. A simple Google search also will let you know if some company already has the name. Note down that if you hire a professional graphic designer in a hurry to create logo etc. without confirming the registration first, you will be recreating the whole range of visuals related to your company. The name must also be available as a domain. This is a must for putting your architecture company and its services online. When you want to create an impressive web page design to give relevant information to the clients, the domain name becomes inevitable as your web address. There should not be a mismatch in the domain and your company name to avoid confusion amid potential clients who search your business online. If your architecture company name is too long, it may not look good on the smaller space available on your business card that you will hand out to your client. So, test the name across all graphic designs such as logos, websites, brochures, billboards, and so on. You can simply draw the sketches of these designs and put the name to see how it looks. Sometimes, visual appeal of the name also matters in making an impression on the audience. Once you have pinpointed a name, do not yet recommend it. Take a second opinion from some experts that you know. In fact, talk about the name in your friends’ circle and ask for suggestions. You can even have an opinion of your graphic design services provider to know if the name will look good on different design items. 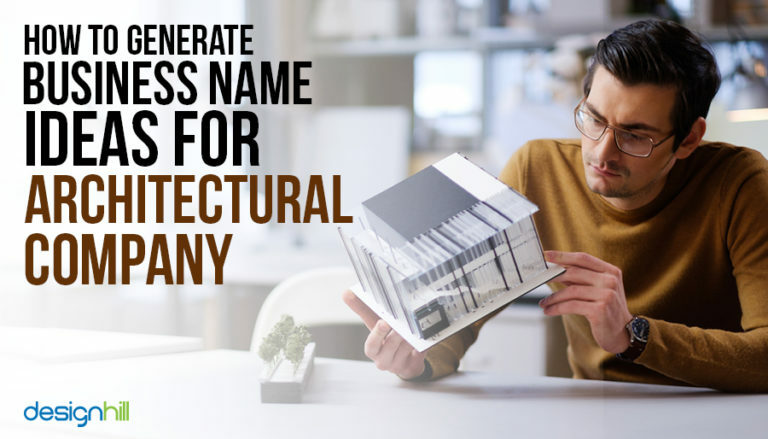 These suggestions may look like basics, but they are vital to naming your architecture company. Also, remember that the naming process is not something you can complete in one sitting. Often, the process goes on due to the cancellation of many names by this of that member of your core team. Therefore, to have patience is the key. But do not settle for a casual name that you cannot change later easily after many months. As your architecture business finally takes shape, it will require some aggressive promotion. For that, you will need visual identities such as logos, business cards, websites, brochures, and others. Here, a leading marketplace Designhill offers you effective design solutions at an affordable price. You will have dozens of new logos etc. design choices at this site for your architecture business. An architecture company should be named for conveying its business and the type of industry it is in. But consider a simple, unique, and memorable name that stands out. It should also be available for trademark registration and as a domain name.